A Pour for A Paw 2017 tickets are NOW AVAILABLE! Buy your tickets today and get the Early Bird discount! Between now and March 1st, get your tickets for $45 for General Public, and $35 for RCHS Members, Students, and Military. Ticket prices will go up on March 1st! Buy your tickets here, rchsks.ticketleap.com/p4p2017/. 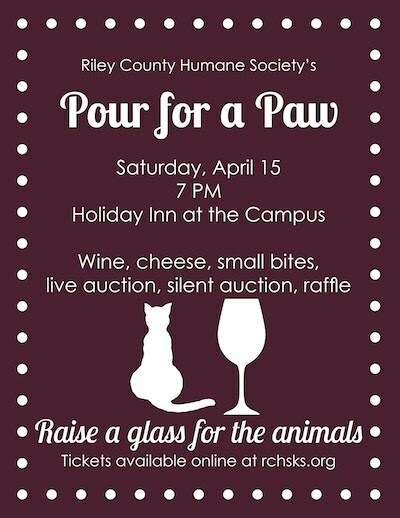 A Pour for a Paw 2017 will be held on Saturday, April 15th 2017 at Holiday Inn at the Campus in Manhattan. We will serve wine, cheese, and small bites, along with a cash bar. The evening features a fantastic live and silent auction, and raffle with a wide array of items and services! See you there!